How To Sell Your Home For Top Dollar In The Real Estate Market? 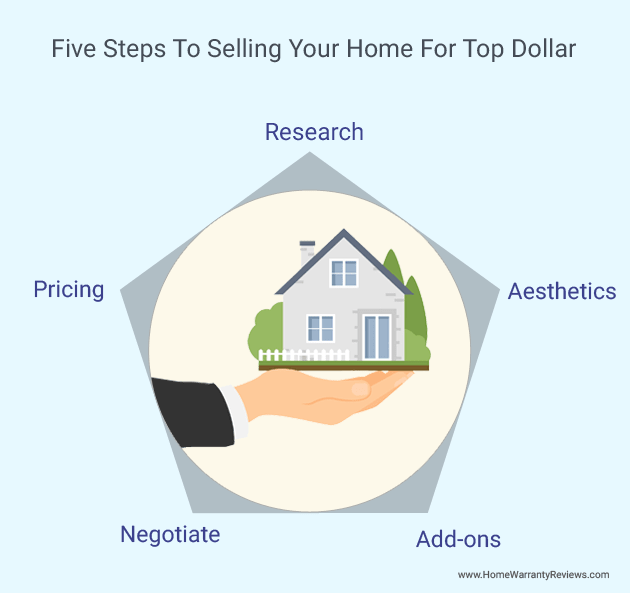 Planning to sell your home and hoping to get top dollar for it? You’ve come to the right place! Selling a home often requires as much thought and consideration as buying one, especially if you are trying to fetch a good price for it. Thankfully, these are a set of pointers you can go through to ensure that you get a good deal. So, sit back, read and get to know how a home can be sold for a great price! Any transaction that involves real estate should be researched well. Selling a home for top dollar is no different. You could begin with finding out what the average market value is for homes in your neighborhood. You could also pick a real estate agent to help you with the sale of property. Real estate agents always stay updated about prices and know the vibe of the crowd. If you do not want to appoint an agent, you can use the old-school method and gather information from friends and family. You should also do some research on the amenities available in the neighborhood as such matters affect the sales price of your house. The Internet is also a very good place to begin your research. You can also make use of online portals to list your house. This will give better visibility and might help you get an idea about prices of houses in your neighborhood. Many factors should be considered while pricing your house for sale. Apart from obvious factors like size, amenities, and age of the home, there are factors like facilities in the neighborhood, proximity to schools/hospitals/parks, connectivity, and history of the locality. Again, internet research will help you with this task and probably be worthy of your time for those top dollars of your home. There are online tools which give you an estimate of the sales price of your home after you provide details. If you have listed your property on an online marketplace, be sure to keep checking in often. Events that happen in your neighborhood like crimes or accidents could adversely affect your listing. Staying updated is key here. Also, unless you fix the right price, a good deal can never happen. If you have placed an ad for your property in print or online media, there is a good chance that many potential buyers will try to contact you to collect information. These folks are also going to negotiate with you to drop the price. While making a small reduction is fine, dropping the price by a large margin could get the buyer suspicious. He/she will begin to wonder if the house is truly worth top dollars if you drop the price without much fuss. The general trend among sellers is to price the house a little above the market value. That way, even if a buyer makes a request to reduce the price, the deal will still be good. Like we said before, real estate agents are of huge help when it comes to negotiating. In fact, the entire negotiation can happen with the agent alone leaving you free of the task of having lengthy conversations with the buyer. Everybody loves add-ons, more so when it comes to property. This is a step which is almost guaranteed to increase the selling price of your home. Research has found that a home warranty plan definitely increases the sales price of your house. These plans not only protect your budget, they will also relieve the seller from future disputes. If an appliance in your home fails, the new homeowner will simply contact the warranty provider and not the seller. You can also put in more shelves or racks to increase storage. Most people are huge fans of ample storage and hence, it could compel people to buy your property. Replacing old appliances will also help sell your home faster. Nobody wants a house that looks old and spooky. Peeling paint, squeaky doors – in general, anything that looks like the Amityville horror house will be seen as a huge turn-off. It could repel potential buyers. A fresh coat of paint is almost mandatory for the house before it goes on the market. You could also enhance the external appearance of the home by improving the garden (if you have one) or you can add some other landscape detailing. You could also renovate the bathrooms (if they are old) or the kitchen for faster sales. The money you spend on upgrading your home can be reaped back once you sell the property. Trust us, decorating your apartment creatively helps lure in buyers! Unless you use the services of an agent, your home could be in the market for some time. Do not let that prompt you to drop the prices drastically. A good deal will definitely come by. In the meantime, read up on various home maintenance guides to give your home a thorough upkeep. You could also get a home inspection done as a home inspection report is something that potential buyers would want. That’s all! Hope you strike a very good deal! Prev Post:How To Own A Home Faster?